Kit includes: (1) Photovoltaic Solar Panel in Bezel with Glass mount adhesive strips, (1) NiMH (Nickel Metal Hydride 750Mah) rechargeable battery installed in Aluminum Tube, (1) 12" Y-Harness, (1) Alchohol Wipe, (1) Instructions. 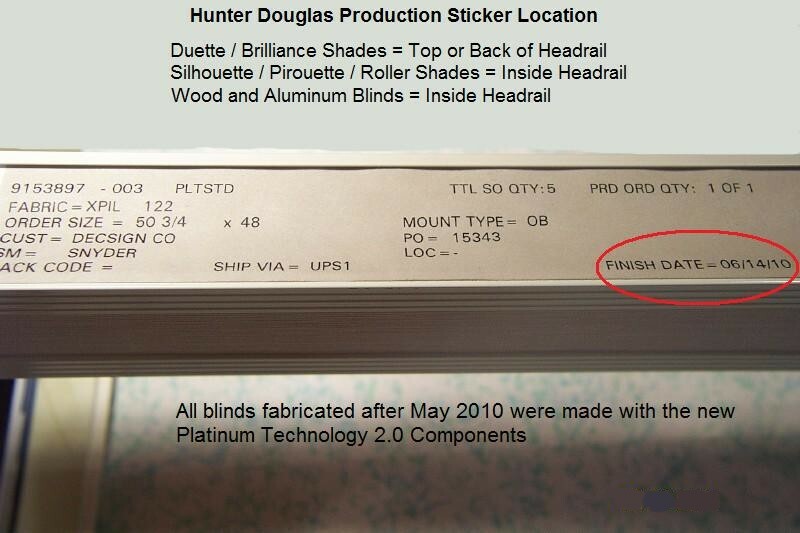 Used for powering Somfy LT30, CT32 and 2" Blind Tilt 12V Motors and Hunter Douglas 12 Volt PowerRise lift systems (see below). Low profile solar (photovoltaic) panel is compact, discreet and easy to conceal. Battery Tube / Wand 12" Y-Harness plugs directly into motor power port. Optional 24" or 48" Y-Harness available to extend reach of battery to motor. 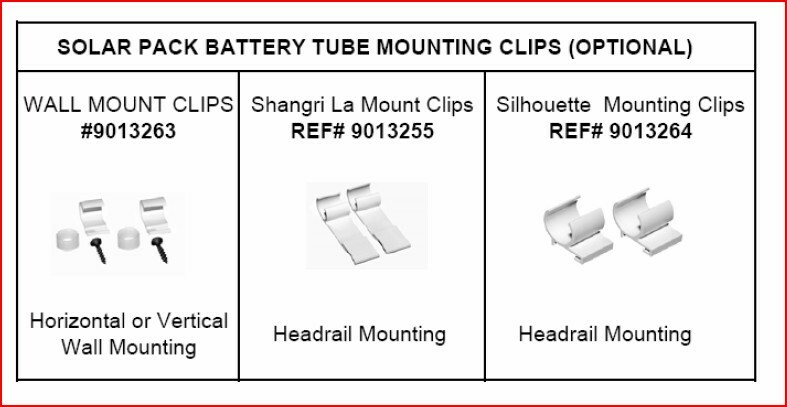 Replaces single (#9013741) and Dual (#9013742) throw away sealed battery wand. 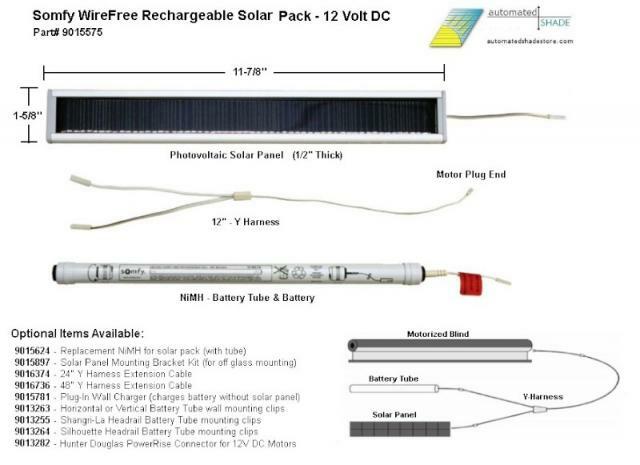 Warranty: 5-Years on Solar Panel, Wire Harness and Battery Holder. No warranty on NiMh Battery but has a life expectancy of 3-5 years. 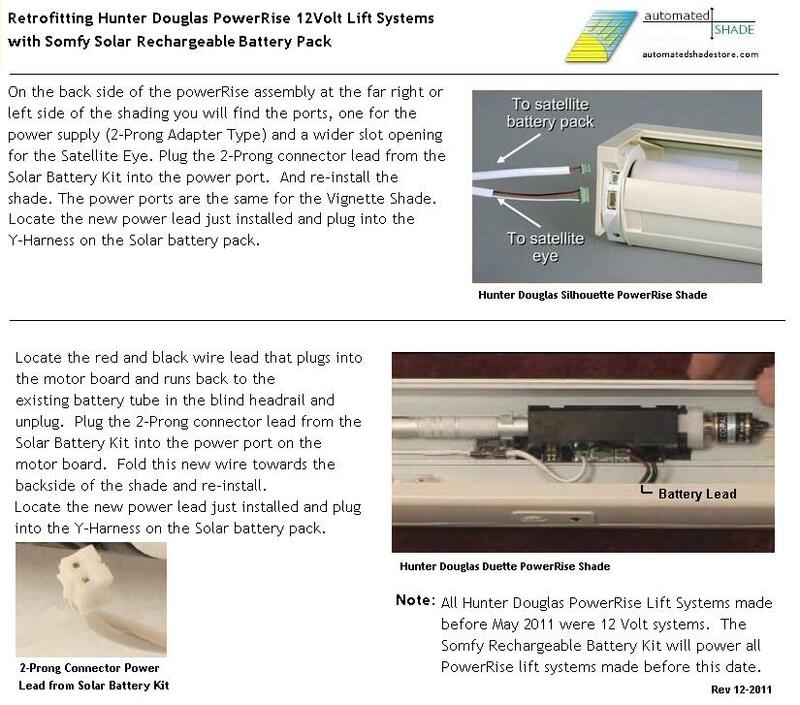 The NEW Somfy Rechargeable Solar Battery Pack is a group of components that work in unison to provide a long life, renewable energy source for Somfy 12 Volt DC WireFree Motors. 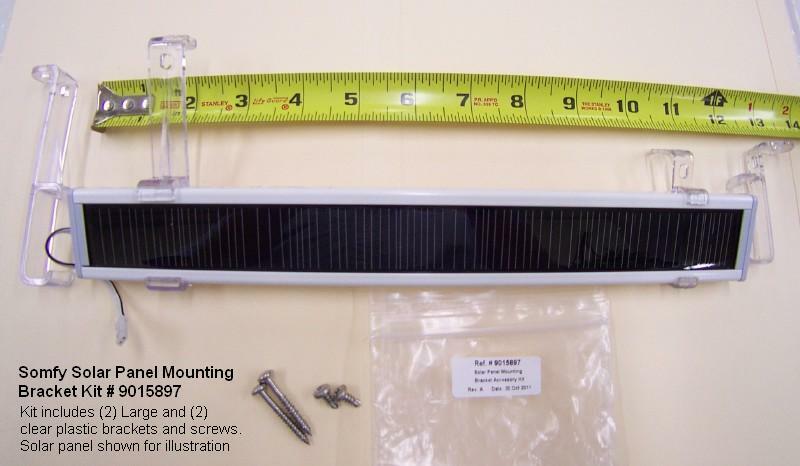 Patented energy saving technology uses sunlight to power WireFree Motorized window coverings by recharging the NiMH battery. Photovoltaics produce solar energy by converting solar radiation (sunlight) into direct electricty (DC). 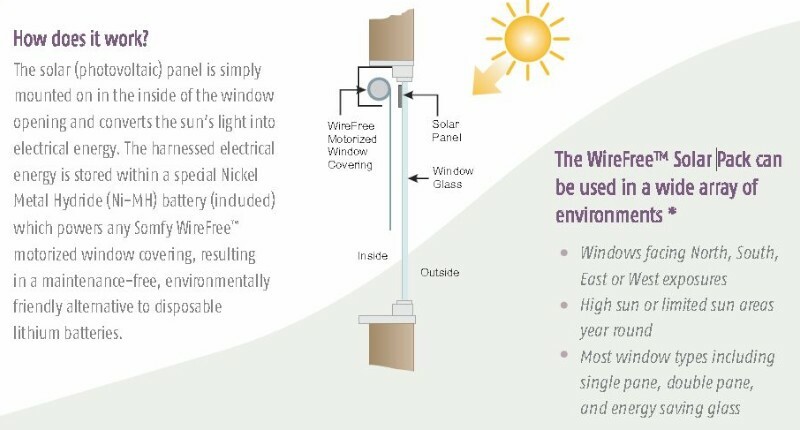 The WireFree Solar Pack's PV panel is mounted on the inside of the window opening and converts the sun's light into electrical energy to power the window blind motor. The Solar Battery Pack is cost effective by reducing battery replacement and preserves the enviroment and provides a maintenance free soloution that does not require an electrician. 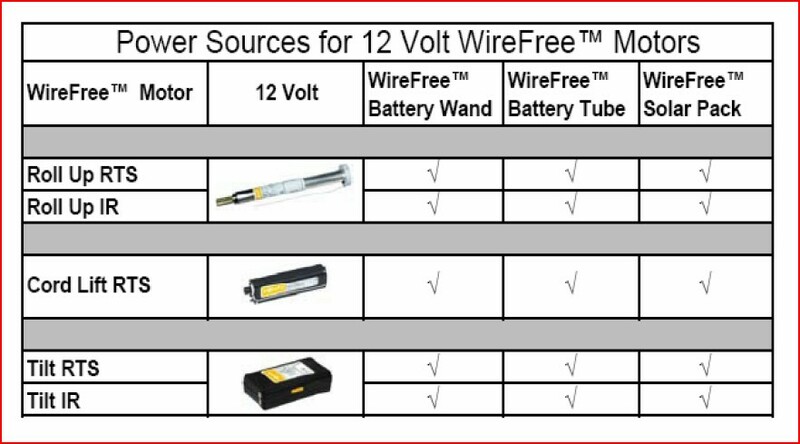 The Somfy Rechargeable Battery Pack is the ideal solution for hard to reach battery tube locations such as second story windows where battery replacement can be challenging. Receive a 10% Discount on the purchase of 3 or More!